Join the #RideSmart Club on Strava. 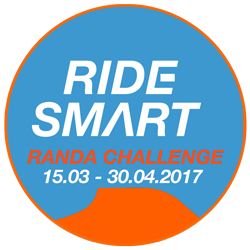 Complete the RideSmart Randa Challenge on Mallorca between 15th of March and 30th of April 2017. Post a picture of your ride on Instagram using #RideSmartRanda2017. GLORY & HONOR: Will be granted at the #RideSmartRanda Leaderboard. FUN: Raffle of amazing prices among all participants who are members of the RideSmart Strava Club. Lucho Dillitos bocadillo are the natural, tasty alternative to modern sports nutrition! Bocadillo are Colombia’s original energy bars. For generations Colombian cyclists have been adding 1 or 2 bocadillo into their jersey pockets before going for a ride. Now, thanks to Lucho Dillitos, you too can experience the great taste of this natural energy source. Take a picuture of your ride, add your Strava ride data, post it on instagram using the #RideSmartRanda2017 and get a free coffee at Sa Plaça Petra. You do not want to miss other #ridesmart-challenges or any information about our partners? Sign up for the #ridesmart newsletter. © 2019 by power2max™. All rights reserved.